Gail White, owner of Saje Natural Wellness (shown above), believes that a key component of owning a local small business is the personal service and care she can provide her clients. These are the local business owners. Twenty years ago, they were the only game in town before the mall and big box stores began sprouting up throughout the Santa Clarita Valley. Sometimes the competition is tough, but the small guy will greet you by name and remember the last item you purchased. The local business owner says it's all about the customer and they are working hard to keep your business. Steve Erengerg from SCV Pools has been in business since 1969. He proudly describes a unique pool he recently completed in Stevenson Ranch. Small business owners, he said, survive by meeting customers' demands. "The people in the Santa Clarita Valley can get their dollars' worth and a real value out of something with local businesses," Erengerg said. "[Local businesses] need to meet people's expectation and demands rather than the company's visions." Business owners within the City of Santa Clarita boundaries got a little boost by the Shop Local campaign designed to encourage shoppers to frequent businesses located within city boundaries. One percent of the sales tax on every purchase made within the city's boundaries goes directly to the city's general fund. Forty-one percent of the general fund budget comes from these tax dollars and that revenue provides funding for projects and programs in the city limits like the Cross Valley Connector and recreation programs. While the campaign is winding down, business owners are encouraged to log on to the city web page and register their business on the Shop Local section. The Santa Clarita Valley Chamber of Commerce has a broader approach, however, as it encourages residents to shop valley wide, including those businesses located in Los Angeles County boundaries such as Stevenson Ranch and Castaic. Promoting local business since 1923, the Chamber boasts a roster of more than 1,800 members. Its primary role is to help those seeking information and assistance. Newly installed Chamber president Chris Fall said the Chamber understands the benefits to the city and the community from the Shop Local campaign, but with 20 percent of their members outside city limits, it is the chamber's job to represent their members first. The Chamber offers a number of networking opportunities and programs designed to help small businesses stay ahead of the curve such as the Infinity Programs. The "Office Depot Program" allows chamber members to receive a discount on the 70 most commonly purchased items, giving smaller businesses the buying power that big businesses can take advantage of, Fall said. Also available to chamber members is a dental and life insurance program for employees of small businesses. "Environmental buffs are also big supporters of shopping local. Another result of spending money close to home is the reduction in gas usage and pollutants released while driving." Many local business owners are committed to giving back to the community that supports them. Take a look at any of the many charity events held in this community and you will find a list of local business owners who sponsor these social functions. Denise Tomey, executive director for the nonprofit Carousel Ranch, recognizes the impact local business has on SCV charities. "We simply couldn't help as many children as we do without the assistance of small local businesses. They are truly the backbone of our funding, both through sponsorships, donations to the ranch and for our fundraisers." Calvin Hedman has lived in Santa Clarita since 1977 and opened his own business here in 1994. When his children were younger, you could find Hedman on the soccer fields coaching hundreds of kids throughout the year. He also spent many hours at Newhall Elementary School and YMCA, all while building his CPA firm. "I got into to all these activities for the kids," Hedman, a father of three, said. "I met a lot of people who would sometimes give me a call. If I couldn't help them, I took that opportunity to introduce them to someone who could." Keeping spending money local isn't always as easy as it may seem, but the SCV's bumper-to-bumper moments still don't hold a candle to the traffic found on the 405 Freeway. Saugus resident Elise Ginsburg said she has learned to negotiate around traffic when she has errands to run. "There is so much traffic. It takes me 20 minutes to get to work because of all the school traffic in the morning," Ginsburg said. When she stops for groceries or school clothes for her daughter, Ginsburg says she shops where and when it's convenient. She never thought about where her tax dollars were going, but appreciates that sales tax could help the city complete new roads. Environmental buffs are also big supporters of shopping local. Another result of spending money close to home is the reduction in gas usage and pollutants released while driving. So how do the local business owners get the word out about their products? Forming relationships with their customers and word of mouth referrals is key. 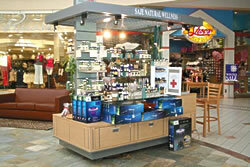 Gail White, owner of Saje, a natural wellness shop, recently relocated inside the Westfield Valencia Town Center. She said most of her customers are local residents. Since opening a year and a half ago, White said the new location will allow her to expand her business by offering more services such as massage and holistic treatments. Knowing her market is exactly what the Small Business Administration suggests to owners. "We carry remedies for headaches, backaches, skin care and body products," White said. "We form relationships with our customers and offer a more personalized service. The people of the Santa Clarita Valley are ready for us."